Good Garage Scheme Car Servicing in Great Britain : Good Garage Scheme member X L Autos robbed of £60,000 worth of equipment – are you able to help? 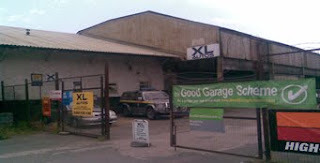 Good Garage Scheme member X L Autos robbed of £60,000 worth of equipment – are you able to help? Martin Hooper and Tony Webber of X L Autos have been trading successfully from the premises in Exeter for nine years with no problems at all. But on Tuesday night a devastating robbery took place, stripping the garage of £60,000 worth of equipment. Martin urged all garages and businesses to prepare for events like this. He advised: “make sure you have alarm systems installed that alerts a call centre even if they are knocked off the wall. It might be expensive but it’s worth it. The police would have been here in minutes if we had them”. Police are investigating the robbery, but you can do your part also by looking out for these items. If you are offered to buy second hand equipment matching the description of X L Autos please call Crime Stoppers on 0800 555 111 and quote X L Autos crime reference number DE/10/69/77.